Hillview offers a total of five acres of water on an eight acre site. The two lakes and four canals are set in attractive countryside with an abundance of wildlife on and around them. Pleasure anglers and those after the bigger carp should opt to fish Moorhen or Heron Lakes, both of which are rectangular in shape with central islands. Moorhen has plenty of bankside vegetation with yellow irises which flower in late spring whilst both have other clumps which provide cover – useful for those who want to fish close in by the side where the fish patrol in the summer. Many pegs on the fishery are also suitable for disabled anglers who should drive to the far end of the car park where they can leave their vehicles on the same level as the lakes. Although the canals will be more of a struggle for disabled anglers to reach, they will find plenty of suitable pegs on Moorhen and Heron. GARY PICKEN IS A REGULAR ‘OPEN’ MATCH WINNER AT HILLVIEW IN BOTH THE SUMMER AND WINTER ALIKE. 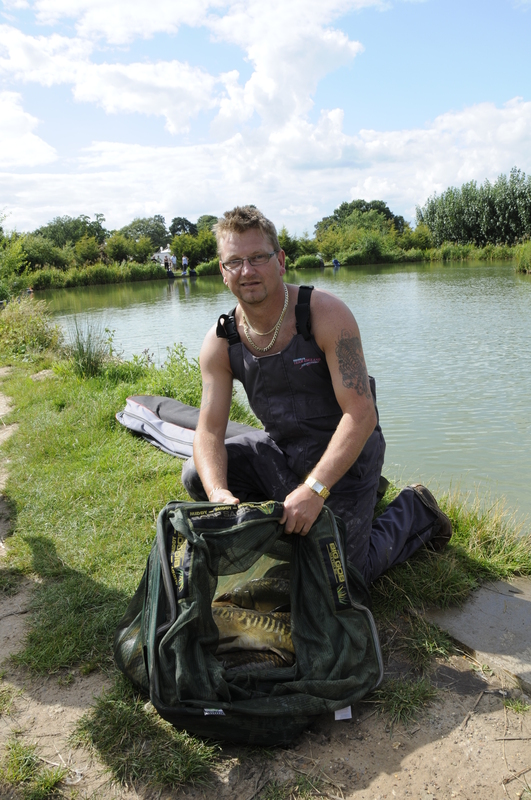 HE IS A MEMBER OF THE CRACK SBS BAITS MATCH SQUAD SPONSORED BY DES TAYLOR AND HE OFFERS HIS ADVICE TO THE VISITING HOLIDAY MAKERS TO HILLVIEW LAKES. Hillview is one of my favourite venues in the South Midlands. High praise indeed as there are other notable venues that I pass on the way down the M5 from my South Birmingham home.The many different year classes of carp at Hillview means that whatever the weather or conditions, there will be always something to give you generous sport. There are no ‘secret’ baits or methods to contend with. Pellet, meat, corn, worm and casters will all get you plenty of fish in conjunction with the pole which dominates match fishing during the summer months. Although, waggler and feeder have their day when cast towards the islands on the lakes. The fishing at Hillview Lakes can be broken down into 2 areas – the canals and the lakes. Here is my basic approach to fishing both. For me, the two main lakes, Heron and Moorhen, are the jewels in the crown at Hillview. Both are filled with carp over 20 lb and there are masses of bream and roach to give any silver fish anglers a change from the carp. Along with a smattering of big ide, rudd and tench, these silvers and stockie carp to 3-4 lb make up many 40 lb plus weights before the larger carp move in to take your fishing weight well over 100 lb. Fishing three lines is good practice on the lakes. The first is at 11-13 metres out on the bottom in six foot of water. The second is at 3-5 metres down or up the nearside shelf and again down the margins for later in your session. The four canals are full of carp well into the double figures as well as a good smattering of roach and skimmers. The back two canals are full of tench that will literally give you bites all day long. The obvious place to start on the canals is well over against the far reeds. These just scream fish and it is wise to feed at least two lines well over and take a few fish before re-feeding and moving to your other line. This ‘rotation’ will keep bites coming for longer. It is also advisable to have a line down the track at 3-5 metres and obviously later in the session do not ignore the margins to your left and right. Nothing fancy – pole rigs need to be at least 0.14mm to 0.18mm for the margins on both canals and lakes. Floats should be 4×16 on the lakes in deeper water, 4×14 will cover everything else with 4×12’s for the margins. Pole elastics should be 12,14,16s depending on the size of the target fish. Pole rigs are simple with a bulk and two droppers beneath. Hooks should be 18, 16, 14s depending on the bait used. As mentioned before, pellet, meat, corn, worm and caster will all score well. Feed pellet, either micro or 4mm MUST be bought on-site. The only other baits that catch well for carp are pastes, which HAS to be made from the on-site feed pellets or cat meat, which can only be fished on the hook and not fed. There are no bait limits in terms of quantity at Hillview, however, my best advice is to keep a little going in regularly to enjoy the best sport from the venue. Enjoy you fishing at Hillview! All nets should be stretched out in car park on arrival. No stink bags/net bags to be taken out of car park onto pools. Nets should be stretched out behind peg before match and only placed in the lake 5 mins before the match starts. There is a strict 75lb net limit, anything over 75lb will see the whole net disqualified. Loose fed pellets must be fishing pellets bought on site. Paste must be made from fishing pellets only and must be lowered in and not cupped. Maximum 2 tins of meat to be used with a minimum 4mm cube size. No method or pellet feeders to be used.